Whoever coined the phrase “two heads are better than one” obviously was not a Rugby League fan. Referees have always made mistakes and they have always felt the ire of coaches, fans, players and their mothers, disappointed in their son’s choice of career. We all love to have a crack when they get it wrong. It’s part of the game. Or was. It’s changed. A lot. It seems to this increasingly disengaged fan that every time there’s been an additional adjudicator added into the mix, the perplexing dramas have increased also. In the past decade and a bit, the game has gone from a sole referee making all decisions with the only assistance from the touch judges, to video refs, in-goal refs and two on-field referees (what’s a “pocket referee”? ), with a bevy of video “rule experts” ready to radio-in a call to the man in the middle, and this is where the game is suffering most. The introduction of video replay technology was a great innovation, but its overuse has set the game back. Has lessened the viewing pleasure. While this may have been a rare misfire in Richie’s commentary, it could easily find a place in this discussion. In those excruciating moments when we all know what the call should/will be after one replay, euphoria is displaced with, “I hope this doesn’t take too long.” It’s where I’d happily sign up for the “if it walks like a duck, quacks like a duck” rule if it meant getting on with the bloody game! I know, “Rugby League is big business. Fans/teams deserve the right decision”, and every other cliché trotted out in defence of the much maligned referees. And this is not an attack upon them. It’s a plea to the administration to do whatever they can to retain some human element, expedite the process, in the hope it will improve the value of the product. In 2015 entertainment is fast, on-demand, and perpetual, and Rugby League has wandered off in another direction as if the game has dementia (or is this my dementia kicking in? Where are my slippers?). The most arduous, infuriating moments are the ones that could have so easily been waved on. Alternatively, I’m convinced the many replays of a high-swinging arm of St George Illawarra Dragon Tyson Frizell to the head of Bulldog Tim Brown, in Round Six, went a long way toward Frizell staying on the field because the replays were in slow motion and didn’t look as bad as it did in real time (I’m applying the Benaud theory here). There was time to show so many replays because it took ten minutes to get an unconscious Brown into a neck brace, on a stretcher, onto a medi-cab and conduct a quick search for his head in the grandstand. I assume that more than one opinion meant doubt and a handball to the judiciary. That swinging arm, in today’s “we must treat concussion seriously” age, goes on a to-do list for later on in the week. Not using the send-off option robs the game of another twist. 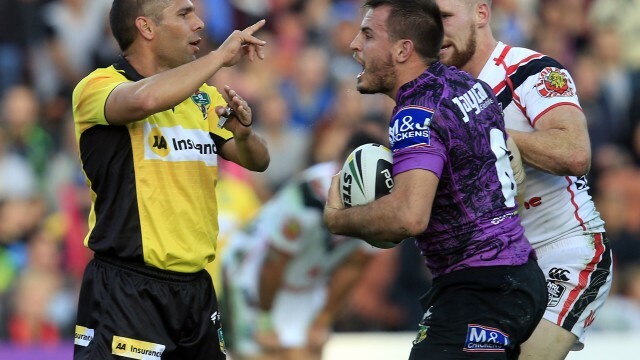 The Dragons should have been down a man and struggling to protect their lead. Instead the Bulldogs were a man down and the Dragons finished way stronger. Any suspension imposed mid-week will only aid next weekend’s opponents…a little. Even ten minutes in the sin bin would have been a more just course of action. The greater number of people having a say in decisions has to result in more doubt and delays. On the whole, the decisions are correct, but the refs need to be supported in making their decisions with a bit more expediency and confidence to be in the moment. I think fans will accept human error if made quickly for the sake of the game, far more than they’ll accept decisions that have no common sense after numerous replays.